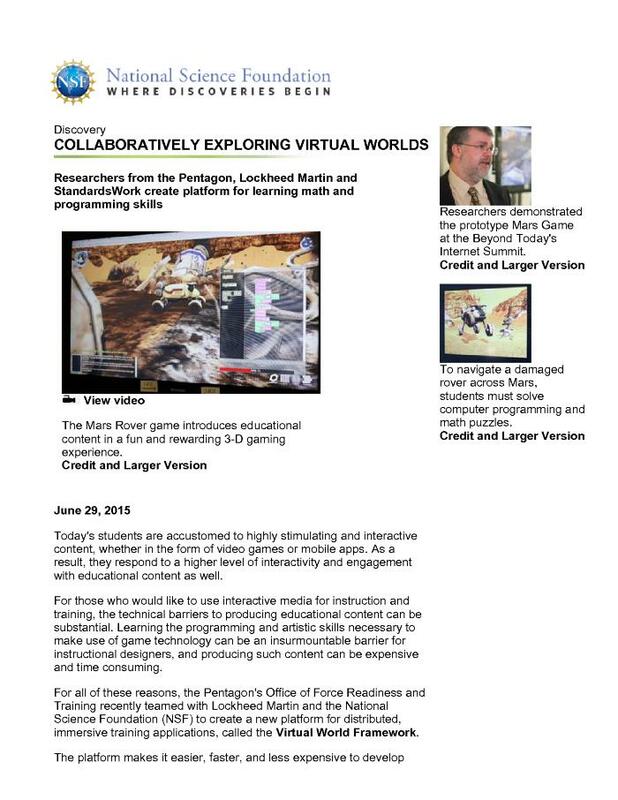 The U.S. Pentagon's Office of Force Readiness and Training is collaborating with Lockheed Martin and the U.S. National Science Foundation (NSF) to create the Virtual World Framework, a new platform for distributed, immersive training applications. The platform is designed to make it easier, faster, and less expensive to develop educational and training games and simulations. The platform allows for multiple players to access the same game or application at the same time through a Web browser and makes use of the Global Environment for Network Innovations (GENI), an ultra-high-speed experiential networking testbed that is supported by NSF. GENI is ideal for the sort of shared and collaborative applications the Virtual World Framework is designed to facilitate, offering very low network latency that enables multiplayer sessions to be nearly seamless. The researchers presented the first game built using the platform, The Mars Game, at the Beyond Today's Internet Summit in March. The game uses the scenario of a crash-landed Mars rover to teach students lessons about math and computer programming. An initial test of the game with 9th- and 10th-grade students in Colorado found the game increased both learning outcomes and engagement levels, and these gains were shared across both genders.